We have stayed in Port Douglas many times before and I have to say Coconut Grove is the best so far! We stayed in a beautiful Penthouse Apartment, complete with our own private plunge pool and spa. Everything was perfect, from check-in until we checked out 5 days later. Nothing was a problem for the ladies in the front office - they booked us on a reef trip and sunset sail which were great recommendations and suited our style. 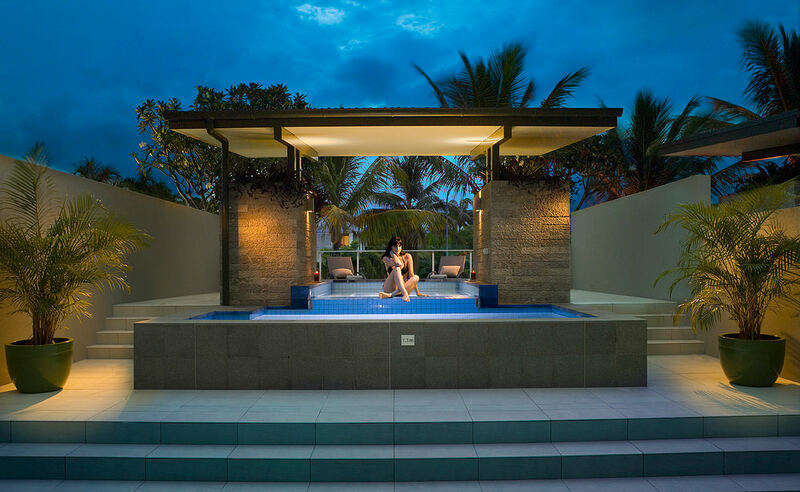 Would recommend Coconut Grove for anyone looking for luxury in Port Douglas. Stunning oasis, in the heart of town. Easy walking distance to restaurants. The decor is very tropical chic modern. I loved that we could swim in our private rooftop pool and spa whenever we wanted and do bbqs. Such a luxury to try. They also gave us a little complimentary cheese platter. Easy parking garage. Love the big kitchen and laundry. Excellent location close to all restaurants, shops and beach. Staff are amazing and very friendly. Coconut Grove was, without a doubt, the best place to stay in Port Douglas. The location was phenomenal (near all the great restaurants and a one minute walk to the beach). The room was spectacular - from the huge bathroom to a massive fully stocked kitchen and barbecue. Additionally, the hotel staff was great! Morgaine, the receptionist, was extremely helpful. She booked our hotel transfer and a trip to the Daintree. She was always one step ahead of what we needed. We recommend Coconut Grove to all those seeking luxury and a great location. What a beautiful place to stay! I traveled with my sister to AUS and NZ this past fall, and of the 6 cities we visited, Coconut Grove in Port Douglas was definitely the best of our accommodations. The rooms are large and beautifully decorated, we had 2 bedrooms, 2 very large bathrooms, a washer & dryer, a balcony, a kitchen (we didn't use), and spacious living room. The location is a short walk to the wharf and all the cute shops, not to mention plenty of restaurants. Currently staying in the penthouse on our honeymoon with amazing rooftop pool and bbq area, as we entered the penthouse on arrival the AC was on making the place nice and cool with a lovely cheese platter in the fridge for us , This place has to be the best place I've ever stayed in, very close to all cafes shops and the marina. We had a lovely time. The location is both central and an easy walk to the beach. The rooftop pool can’t be beat. And the fresh prawns cooked on the balcony bbq were the perfect touch. We plan to return! I stayed at Coconut Grove during November and I simply could not fault it. We had a penthouse apartment for 4 nights and I wish we had booked longer. Our apartment featured our own private rooftop plunge pool and spa and a large out door entertaining area. The property is right on the main street in town so in 5 minutes you can be on the beach, shopping or eating at great restaurants. We returned to port douglas for our first year anniversary (last year we married in port douglas) this was however our first time staying at coconut grove and we can say with certainty that this is the best place to stay in port douglas, close to everything, but still quiet apartments, great pool and jacuzzi. The apartments were fantastic and with bbq facilities, everything that you could need was provided, the cleaners were extremely friendly and always happy to help, reception staff were so welcoming, we think so highly of coconut grove and will definately be returning every year for our anniversary! Thank you for giving us a holiday to remember (and brag about)!! My sincere thanks once again to you (Nikki) and all the staff at Coconut Grove. Everyone had a fantastic time and we look forward to returning soon.